After being in an accident, stop by Boothbay Collision and one of our estimators will be more than happy to assist you with your insurance claim, whether you are the insured or as a claimant. If your vehicle is non-drivable call (207) 315-6140, we will be more than happy to have your vehicle towed to us. Most individuals are not familiar with the insurance claim process. Our friendly, knowledgeable staff work with all insurance companies on a day to day basis and are more than happy to assist you. If you have already made a claim, REMEMBER IT IS YOUR CAR…..YOUR CLAIM…YOUR CHOICE where you have the vehicle repaired. No matter what collision center you choose, the center will warranty your repairs and work with any and all insurance companies on your behalf. 13 most common steps to the repair process. Take your vehicle to the shop of your choice for a free estimate! Work with one our estimators to assist you with your insurance claim. Fill out an authorization of repairs, a direction of pay, and any additional paperwork your insurance company may request. ​Be sure to have a copy of your registration and claim number/contact info from accident if they have not assigned you a claim number yet. Once we have completed the estimate and gotten the required photos will get in touch with the insurance company and send a copy of everything off to them. ​If you are in need of a rental vehicle in the mean time enterprise in Wiscasset is an option or, if one is available, we have courtesy vehicles to use. ​When confirming your appointment we will go ahead and order parts based off the estimate your insurance company gives us. If there is any structural damage, the vehicle is pulled onto our frame machine, where the unibody frame is measured, and returned back to factory specs. 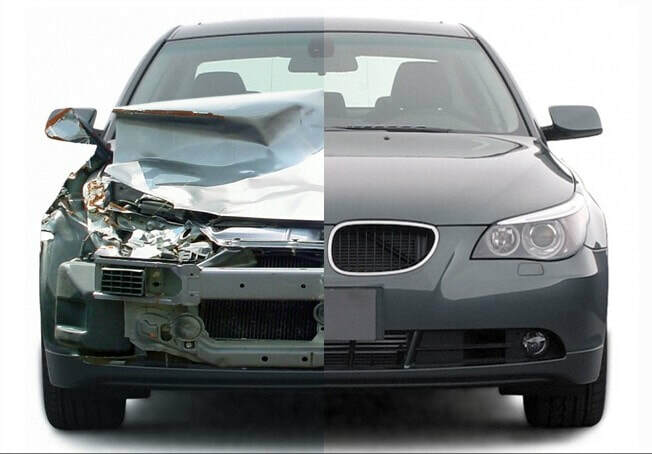 Auto body repair - The auto body Repair Department replaces exterior panels, and all metal finishing that may be required. Auto body Refinish - All panels are prepared for the painting, then primed and sealed to assure good adhesion when the final top color and clear coats of paint are applied. Auto body detail - The interior and exterior of the vehicle are cleaned. Final inspection - Vehicle is taken for a road test to ensure everything is working properly and final overview takes place. Throughout the repair process we stay in touch with each customer letting them know the status of their repairs. Any of our rental vehicles can be brought right back to our facility, or our concierge service can pick you up. If you are using enterprise you will have to contact them directly to return your rental vehicle. If you have any questions or concerns feel free to contact us. We thank you and appreciate your patronage!